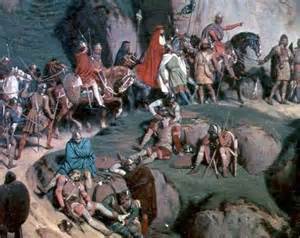 Charlemagne conquers the Lombards - In 774, early in his reign, Charlemagne conquered the Lombards and became King of Italy. The war resulted from a dispute between Desiderius, King of the Lombards and Pope Hadrian I. Desiderius had been encroaching on Papal lands and Hadrian appealed to Charlemagne for assistance. Charlemagne sided with the Pope and crossed the Alps from Gaul into Italy in 773 (much as Hannibal had done a thousand years earlier), and went to war with the Lombards, driving them back to their capital of Pavia. Pavia fell in the Spring of 774 and the Lombards were defeated. There wasn't much resistance from the Lombards, the Franks simply overwhelmed them and the entire campaign lasted less than a year (including the time it took to travel to Italy). Charlemagne restored lands lost by the Papacy and kept the rest.